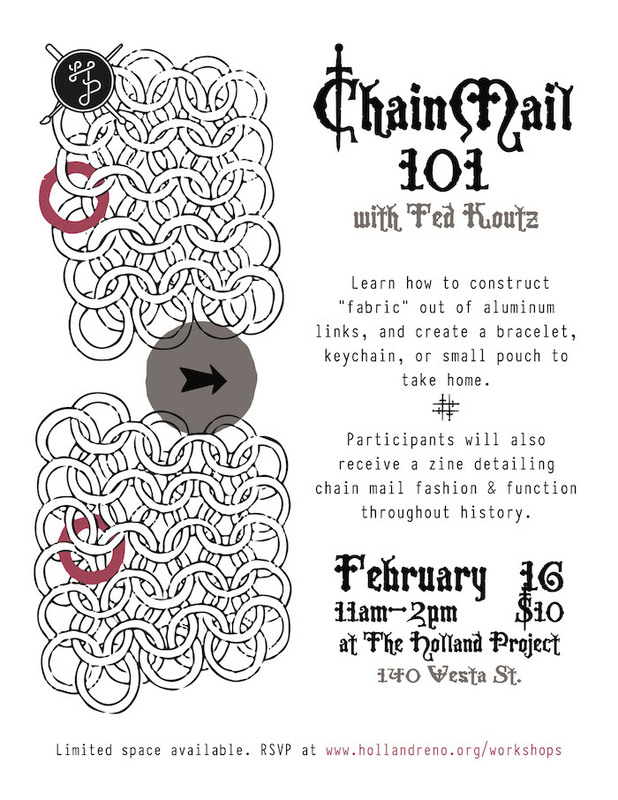 Join us and resident DIY metal-worker & artist Ted Koutz for this workshop that explores modern applications of the ancient art of chainmail. Ted will guide students through the construction of chainmail link fabric, with instruction on how to expand or contract the fabric like modern knitting to make shaped & tailored items. Participants will be able to leave with a bracelet, keychain fob or small bag they’ve made out of aluminum rings, with 7 color options. This workshop will also include information about the history of chain-mail as a form of armor in Europe, Asia and Africa and jewelry/couture over the past 2500 years, in the form of a detailed zine.